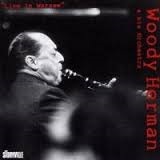 A concert in Poland by the Woody Herman Orchestra resulted in three LPs' worth of material that was originally put out by the European Poljazz label. This Storyville single CD has all but three numbers released on two of the albums and gives listeners a pretty definitive look at how the 1976 Woody Herman Big Band sounded live in concert during the era. Most notable among the sidemen are Frank Tiberi on tenor and keyboardist Lyle Mays (just before he started teaming up with Pat Metheny). The repertoire is fairly typical, with remakes of "Four Brothers," "Early Autumn," "Woodchoppers Ball" and "Fanfare for the Common Man," along with extended versions of "MacArthur Park" and a rapid "Caldonia." It is a pity that no real liner notes are included with the CD, but the music is quite enjoyable and well-rounded.